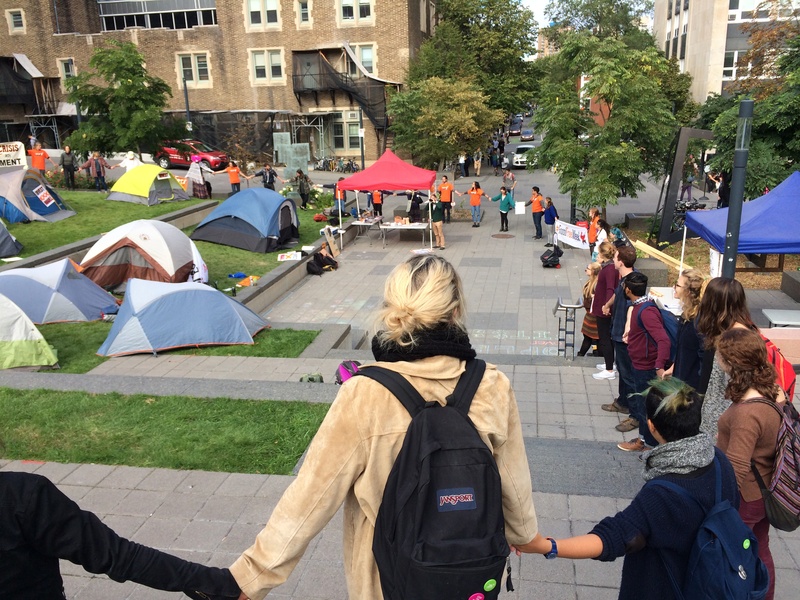 As Divest McGill’s Fossil Free Week came to a close, about seventy members and supporters met at McGill’s Community Square for a final rally at 3 p.m. on Friday, September 25. Led by Julianna Duholke, an organizer with Divest McGill, speakers took turns offering closing comments in regards to the week, which included a camp-out in front of the James Administration building and a protest march on the CBC–Radio-Canada building, where the French-language federal elections debate was held on September 24. McGill alumnus Curtis Murphy, a founding member of Divest McGill, expressed pride in the growth of the organization. Recalling how there were originally about six people involved when initiating their first petition to be presented to the Committee to Advise on Matters of Social Responsibility (CAMSR), Murphy explained how the group had stood the test of time. In addition to the speeches, the rally included a performance of two songs, one in French and one in English, by three members of the Raging Grannies, (a group of activist elder women who attend and sing songs at protests) who came to support the organization’s cause. The event concluded with the participants forming a symbolic circle around the square, joining hands to chant their slogans one last time. “Although [Stuart] “Kip” Cobbett, the Chair of [CAMSR and the Board of Governors] is away, we’ve interacted with a few of the other members of the committee and […] they definitely felt the pressure,” noted Cameron.